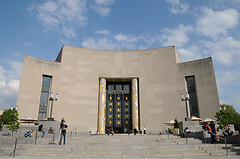 Today’s adventure – apart from the usual quest for a place to live and our good son’s gym classes – lead us to the curious building, symbol and institution that is Brooklyn Public Library. This massive structure, as one would suspect, houses an immense collection of books. As the well-cultured and literate people we are, we came in, sat down and had a late lunch in their café. Which was good. Having taken care of those more basic needs, we started exploring the place. What I should have expected, but had not taken into consideration, was the fact that the collection of Russian literature in this library is immense. In the short time we have been living in Brooklyn, I have heard Russian spoken on the street many times, and even the electronic ticket machines in the subway offer a version in Russian – not to mention the library website itself. And so, the library is most well-equipped. If we choose to stay in this part of the city, I will certainly have something to look at. Also, looking through their catalogue, I found a lot of interesting historical material. Good times. Now, what I found most interesting was their incredible list of activities. Not just because it is extensive – they get into a lot of different areas – but because it is clear that a large group of volunteers put a great effort into helping with homework, teaching languages and the like. And it does remind me of something I often thought of back home in Denmark: The way it is possible for a community to tap into the resources in it. At one point I offered my experience and abilities in IT to the library in Odense, but it was clear they did not want volunteers, because they felt that it was a job for the library, a part of their service. Here in Brooklyn, however, I came across a Japanese class while browsing the Russian books. A small group seated beside the language teaching materials, they were going through the Japanese what is this, what is that questions. They were just sitting there in the open room with a lot of people passing by, while the teacher was showing the students how to go about it and directing the questions. This was a fascinating way to channel the cultural diversity into something enlightening. Most of our stay here so far has been dictated by the need to find somewhere to live. A lot of practical questions have been resolved over the last couple of days, and since we came here – almost two weeks ago, how incredible is that – we have seen a lot(!) of this town, getting around to look at apartments with real estate brokers, one more colorful than the other. That is why it was such a positive experience to see a cultural side. We are not here for the real estate, after all. Just a few words. The little family has arrived in New York, and we are currently using a Brooklyn hotel as base camp, while we are out chasing apartments. While this is quite taxing and not something I would recommend for the impatient, I can’t deny that it has meant that over a few days, I have gotten to know Brooklyn and Manhattan to an extent I would not have expected. Our good son is keeping his spirits up, even if he does have a hard time here. One thing is that we have to drag him all over town to look at apartments - which could make anyone impatient - but he clearly misses other children. Has been used to being surrounded by other children every day, and he gets lonely; often, in cafes or around playgrounds, he wants to play with the other children and is unhappy to leave them. But he goes forward, like all of us. I hope we find a place to settle soon. That will be better for all of us; then we can find him someone to be with in the daytime, and I can start looking for work.